'Serial Killer' Who Worked As Gardener Buried Remains In Planters, Toronto Police Say : The Two-Way Authorities suspect Bruce McArthur is responsible for the murders of at least five men. Remains of at least one of them have been found buried at the bottom of a garden planter. 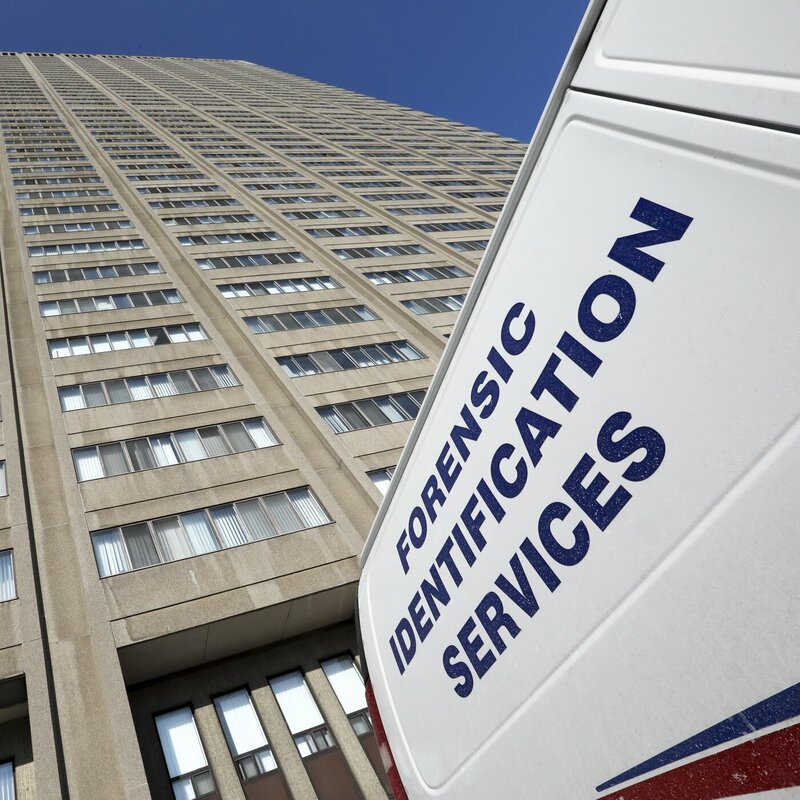 A Police Forensic Identification Services vehicle on scene while authorities comb through an apartment in Toronto in connection with the investigation of an alleged serial killer. Editor's note: This report contains graphic descriptions that some may find disturbing. Police in Canada say they are undertaking the grim task of searching backyards, flowerbeds and planters for human remains after a Toronto gardener was charged with killing at least five men and dismembering their bodies. However, authorities suspect Bruce McArthur — who was arrested on Jan. 18 and initially charged with two counts of first-degree murder — has killed more than just the five people reflected in the charges announced Monday. "It's a serial killer. An alleged serial killer," Toronto Detective Sgt. Hank Idsinga said at a news conference on Monday. "He's taken some steps to cover his tracks and we have to uncover these victims and identify these victims." Remains were found in the bottoms of large planters in the backyard of a Toronto home McArthur used as storage for his landscaping business. Authorities said they were searching some 30 residences where McArthur did landscaping and may have hidden remains. The known victims are believed to have disappeared between 2012 and March of last year, authorities said. All five had ties to a predominantly gay neighborhood in Toronto known as the Gay Village and were all of Middle Eastern descent, Idsinga said. However, he said that police are also looking into possible victims outside that community. "The city of Toronto has never seen anything like this," he said. "The lead homicide detective also revealed Monday that police had made a grisly discovery: dismembered, skeletal remains of three unidentified people in planters at a Leaside home. The remains are now undergoing DNA testing. Investigators have seized 12 such planters and continue to search the properties with the belief that there are more remains to be recovered." One couple, Ron Smith and Karen Fraser, hired McArthur for years to mow their lawn and tend their garden and enormous planters in exchange for allowing him to store his gardening tools on their property. "He took this simple arrangement and did more and more and more for us," Fraser told the Star earlier this month, when the remains of the first victim were discovered on their property. "All of our pots around the house were suddenly filled with beautiful flowers." "We just hope the remains are just in the planters so they go away and not in the ground," Fraser said. "If they find something buried in the backyard, that's a different feeling." Idsinga told reporters that police expected to find "more remains at some of these properties that we are working to recover." "We have seized quite a few planters from around the city and we will continue to do that," he said, adding that "there are at least two sites that we do want to excavate where people might be buried."